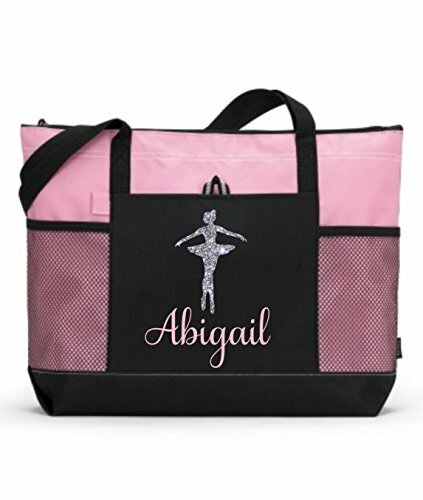 The perfect dance bag for all ages. My daughter loves hers. It is the perfect size for her 4 pairs of shoes, a change of clothes and her snacks and water. Your bag will be personalized to your liking. Please include the name you would like on your dance bag in the messages to seller section at checkout. We could also do a fancy monogram as well. Image will be pressed on using our professional heat press and high quality vinyl resulting in a bag that will be loved for years! Production time on these is super fast at 3-5 days. Bags measure 19x14 when laying flat. Color: Pink and Black with a glitter silver ballerina and a matching pink name. If you have any questions about this product by Tommy Rose Lane, contact us by completing and submitting the form below. If you are looking for a specif part number, please include it with your message.